Steel Mill bearings and chocks are a common cleaning application in a StingRay Parts Washer. 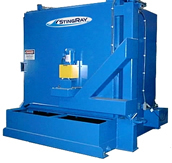 Our parts washers, designed for steel mill bearings and other large industrial applications are well equipped to handle the stresses of day in and day out work in the Steel Mill. Bearings and chocks are thoroughly cleaned and dried in short 15 minute cycles utilizing the power wash process. Bearing greases are easily removed even between the rollers and the cage. Parts are rinsed and rust inhibitor applied preventing flash rust common in completely cleaned and degreased metal components. Steel Mill bearing Washed in StingRay Parts Washer. "Click image for larger view." Steel Mill bearing Race Before and After Washing. "Click image for larger view." Rollers are clean even between the cage. "Click image for larger view."